Builder's Engineer: Capillary/crystalline Waterproofing Systems. Capillary/crystalline systems are mixtures of cement and sand in combination with proprietary chemical derivatives in dry or liquid form. The systems are applied in trowel, brush, or spray applications. Unlike other cementitious systems however, capillary have the additional advantage of an application using only the dry mix product that is broadcast directly over concrete that has not yet reached final set and cure. This is referred to as the “dry-shake” method, commonly used on slab components as a vapor barrier, as additional protection with below-grade slab waterproofing systems, or as a stand-alone waterproofing system. A typical dry-shake application is shown in Fig. 2.36. A capillary/crystalline system not only waterproofs, as a system itself; the chemical additives are able to penetrate into the concrete wall or slab and react with the calcium hydroxide and available capillary water present to form crystalline structures within the concrete itself. These crystalline structures block transmission of water through the sub- strate, adding additional water repellency to the envelope components. 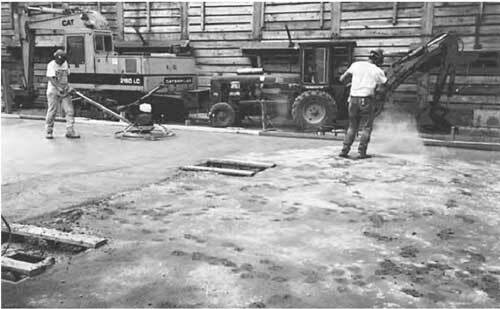 FIGURE 2.36 Dry-shake application of crystalline cementitious waterproofing. ● No need for a protection layer. ● Some products have stated capability to seal hairline cracks that occur after installation. ● Most are not harmed in the presence of chemicals and acids, making their application ideal for storage tanks, sewage treatment facilities, and similar structures. ● Penetrate and react with the concrete substrate to form additional “belt and suspenders” protection. Curing installed systems is critical for adequate crystalline growth. The curing should continue 24–48 hours after installation. Concrete or masonry substrates must be wet to apply these systems, which may be installed over uncured concrete. In exposed interior applications, coating installation should be protected by plastic, dry- wall, or paneling applied over furring strips. Floor surfaces are protected by concrete overlays, carpet, or tile finishes.